The women’s basketball team received potentially great news on Monday: when it tips off its opening game of the NCAA Tournament on Friday at 1 p.m., it will do so a mere two hour drive from its home court — in College Station on the campus of Texas A&M University. Rice has a chance to send enough fans to make it feel like a home game. That could matter. A lot. The Thresher editorial board strongly supports the Student Association’s efforts to prevent violent and sexual abusers from holding elected office in campus-wide organizations, including the SA Senate. We believe this change is one that should be implemented as soon as possible — not only at a campus-wide and SA voting level, but also for certain positions at a residential college level. Revelations related to Virginia Governor Ralph Northam’s blackface appearance led to similar discoveries at Rice — in our very own Campanile yearbooks. This should not come as a shock to anyone. Rice, which was founded by a slaveowner, did not admit black students until 1965 and like colleges in Virginia, regularly engaged in racist practices like blackface. The Thresher was no exception, not only reporting on minstrel shows (1962) but also including racist, editorialized comments. Now, less than 60 years later, it would be insulting to claim that we are a completely different university. The traditions that this university is founded on were birthed during a racist time, and time and time again we see that we are still far from an equal world. Rice’s connection to the world’s first genetically altered babies is alarming. Not only was a former Rice graduate student leading the research, but an active Rice faculty member has academic and financial stakes in the project. Rice released a statement that the work is inconsistent with the ethical norms of the university. But the troubling truth is that while Rice students are introduced to the honor code during Orientation Week, most will go their entire undergraduate experience without a crash course, let alone a comprehensive one, in ethics. 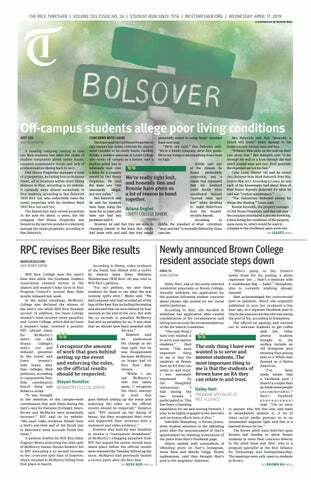 This week, as promised, Rice officials sat down with representatives from the Rice International Student Association (see p. 1). Unfortunately, the administration’s comments described by RISA members are symptomatic of an overall apathy towards meaningful progress in financial support for international students. This is our second editorial of the year on the topic of international student aid because we feel it is important not to let this issue be swept aside in a private meeting. Once again, we are calling for greater transparency, not only through clear financial goals but also through increased and transparent communication with international students on how Rice can better support them. Three changes to Rice University students’ revered annual Beer Bike are under consideration: reducing the number of bike team members to six bikers from 10 bikers, moving the races’ start time to 8 a.m. from 11:30 a.m. and allowing A-team members to participate in alumni races. As incoming students enter Rice, many are surprised by the degree to which the university’s Honor Code extends trust to the student body. The Thresher believes the honor system has the potential to help both students and faculty, but in its current state, the system is broken: As the Faculty Senate Task Force currently working on the issue recognizes (see p. 1), cheating remains far too common and honor rules are applied unjustly and unclearly. Due to a new Texas state law, Rice University Police Department will now be subject to open records requests (see p. 1) for information on their policing activity, which includes correspondences, activity logs and other documents. This requirement marks a continuation toward increased transparency in RUPD, following the introduction of body cameras to its officers in April (see “RUPD implements body cameras” in the Sept. 2 issue of the Thresher).